We will be making an early exit this week, once again heading to higher elevations to enjoy the cool breeze and relative quiet of the Sierra Nevada Mountains. To you it may be Thursday, but here, it is Friday, and therefore it is Lite. The financial markets reacted quite favorably to what many perceived as dovish remarks by Ben Bernanke before the Senate Banking Committee yesterday. The response from some of our elected officials to the Fed Chairman's appearance on Capitol Hill was not nearly as favorable, a few of them overly concerned about the nation's economy and monetary policy - solid GDP growth amid rising prices, high tax revenues but stagnant real wages, robust corporate profits but negative personal savings, a stalling housing market amid rising interest rates. Does anybody really know how to steer this thing? Inflation is NOT out of control. And, I say it, definitely one more time - inflation is NOT out of control, and if it is we will further pursue it in the question and answer session. All indicators of inflation show that while it may be higher than in the last few years, it is still far below what we saw in the last few decades. Key indicators like gold are off their highs of earlier in the year and productivity has kept unit labor costs at a point-oh-three percentage increase. The Fed is chasing an inflation monster that is just not there. I hope the Fed realizes that before it's too late. Normally, some fun would be had with Senator Bunning and his view on consumer prices and monetary policy - it's not clear what a "point-oh-three percentage increase" is, or how gold off of recent highs but still up fifty percent in the last year is an all-clear signal - but there are tent poles to inspect. The entire two and a half hour group therapy session should be available at CSPAN for at least a couple days - the Q&A rarely disappoints. Despite energy prices that declined by nearly one percent for the month, the Consumer Price Index came in hot again in the latest report from the Bureau of Labor Statistics. The all-items CPI rose at an annual rate of 4.3 percent, exceeded only one time in recent years last September, while core CPI was up 2.6 percent in the last year. As anyone who has filled their gas tank lately will tell you, high energy prices have not gone away - they just took the month of June off. They will be back, maybe stronger than ever, in next month's report. For some strange reason, prices for men's and boy's apparel has fallen by two percent in the last year, while women's and girl's clothing has risen in price by about one percent for the same period. The Commerce Department reported that housing starts declined by over five percent during the month of June and housing permits fell by almost as much. The inventory of new homes is now at record levels and mortgage applications are down over 30 percent from year ago levels. The housing market index, reported by the National Association of Homebuilders, fell for the sixth straight month (now down 11 of the last 13 months) reaching levels not seen since 1991, as slowing sales, increasing cancellations, and rising building material costs contributed to the continuing loss of confidence. Why did Ben Bernanke ever accept the job as Federal Reserve Chairman? It's not like he's saving $100 million in taxes like Hank Paulson, the new guy at the Treasury Department. Did he really know what he was getting himself into? Falling home prices would help to get inflation under control if they were counted in the consumer price index. Not to be outdone by San Diego County earlier in the week, this report from the Sacramento Bee tells of real estate in three counties near the state capital having lost ground in the last year. After five years of fast-rising home prices in the capital region, an increasingly entrenched slowdown in sales and a pileup of resale inventory is taking its toll. For the first time since the late 1990s, median sales prices for homes in Sacramento and Placer counties have slid into negative territory compared with the previous year. Sacramento County, as the region's biggest real estate market, saw collective median sales prices of new homes, condominiums and existing homes dip to $368,000 in June -- down 1.3 percent from $373,000 in June 2005. Placer County registered a June median sales price of $452,000, down 6.2 percent from $482,000 in June 2005. 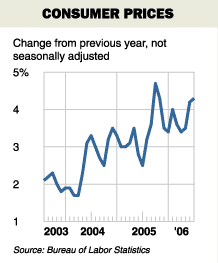 The county's last year-to-year price decline was in January 1998. With an increasing amount of commentary indicating that there will be no appreciation in real estate prices for years to come, maybe now is a good time to put real housing costs back into the CPI - they can always remove it later when home prices begin to rise again, maybe sometime around 2011. 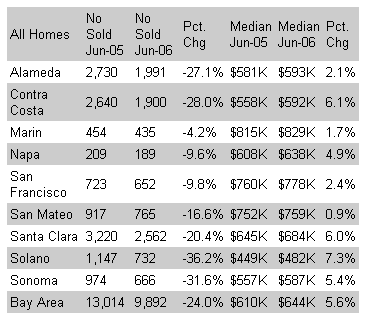 DataQuick released another real estate sales report on California housing yesterday, this one for the Bay Area. It really looks strange to see all those single-digit yearly increases - it will be even stranger to see a bunch of minus signs in that column. The last five years have conditioned many to think that 20 percent annual increases were normal - in a bad year it might go as low as 14 percent. San Mateo County looks like it's about ready to join San Diego, Sacramento, Placer, Almaden and probably a few other counties that have posted annual price declines. In this update, DataQuick President Marshall Prentice commented, "The Bay Area's market is reaching the end of a real estate cycle, it looks like prices could flatten out sometime this fall. What happens after that is anyone's guess". What about the gains Marshall? Aren't the gains of the last five years, or at least "almost all the gains" of the last five years here to stay? Now it's anyone's guess? The gentleman in this story has much bigger things on his mind than monetary policy, inflation, and housing (although he is near the Denver housing market, so rising interest rates, soaring energy costs, and dreams of real estate riches may have been a factor). An Air Force officer pleaded guilty Friday to defacing cars with bumper stickers supporting President Bush, and was given a two-year deferred sentence. 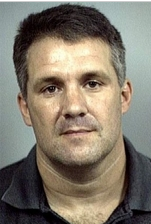 Lt. Col. Alexis Fecteau, a decorated officer who flew 500 combat hours in the Gulf War, Kosovo and Bosnia, pleaded guilty to felony mischief and must pay restitution to the owners of the damaged cars to clear his record. Fecteau blacked out pro-Bush bumper stickers and then spray-painted an expletive over them. The name of the Lieutenant Colonel's lawyer is Mulligan - he probably gets kidded from time to time after losing a case. Reading this story might leave you with the impression that some engineers are strange. Well, some are, but they're mostly harmless. In these days of “fast” and “convenient” I decided to commence a work of “painstaking” and “craftsmanship”, making my own wristwatch. I have had the idea for a certain arrangement of the watch dial, as on the image at the right, for a while now. My investigations into available movements showed that no production movement would give me this layout. After a long period of indecision and wondering what I was really getting myself into I decided to make my own movement, followed by the case and dial. That is a big jump, but we engineers are used to creating things that didn’t exist before so it was mostly the craftsmanship portion of the work that worried me. Am I able to do this watchmakers work, work at such a small scale? To put the chances on my side I decided to do two things: 1) take the watchmaking correspondence course of the BHI, which gave me a lot of the basic skills, but which I have to admit I haven’t even finished the first of three years, and 2) make a complete CAD model of the movement and watch before starting. My favorite part was when he forgot to shorten the threaded part of the click screw that had replaced the temporary stud on the ratchet wheel. If you thought it was going to be all fun and games from here to the end of today's post, you were wrong. It seems Deutsche Bank is now completely out of control after having witnessed Barclay's introduction of Exchange Traded Notes base on commodity futures. This commodities thing is really catching on. Soon they'll have dozens of commodity funds to compete against the thousands of equity and bond funds. When you see a separate commodity ETF for Azuki beans, that will be your cue to exit the commodities markets. Aren't those I-Bonds from Treasury Direct supposed to be protected from inflation? According to the Treasury Direct website, they'll only pay an annual rate of 2.41 percent for the period from May thru October of 2006. Maybe they're just supposed to protect you from "core" inflation. Upon further review, it looks like the annual rate for the previous six-month period was an exceptionally high 6.7 percent, so if you average the two it works out to be just over 4.5 percent. That sounds about right if you were to use "government protection" from inflation, however, if you were looking for real inflation protection over the last year, you'd have been much better off buying gold coins and earning almost 50 percent. 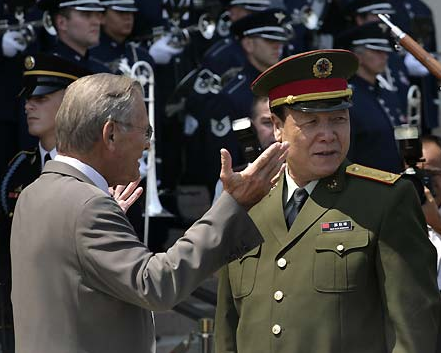 The China Daily reports that earlier in the week, U.S. Secretary of Defense Donald Rumsfeld ate a raw onion, then met with China's Central Military Commission Vice Chairman General Guo Boxiong outside of the Pentagon. Just kidding - the satire from The Onion is next. But, as long as we're here, it's worth noting that in 2006, the phrase "Henny Penny, the sky is falling" is not nearly as cute as it was three years ago. The editorial staff at The Onion is back at work. In this report, they observe a strange voting pattern at the Supreme Court. The Supreme Court's third 5-5 vote in the past month has some justices wondering whether one of their number is voting twice. "As the highest court in the land, it's vital that the Supreme Court observes the basic rule of one vote per justice, even if it's hard to pick a side," a spokesman for Chief Justice John Roberts said. "The court will begin again on Thursday in the usual fashion, writing votes for SCOTUS case 11816, People v. Padilla and Brown, on little slips of paper, placing them into the Supreme Court voting hat, and not peeking." Observers are calling this the worst breach of court procedure since Chief Justice Warren Burger temporarily moved the court to an Arlington, VA Red Lobster for the inaugural Lobsterfest in 1983. The terms SOTUS and POTUS always crack me up. here is how bad it is in agriculture. I read an article that some apple orchards are making vodka just to help survive. tim- I read a rumor that jim rogers sold his house and is moving to china, any confirmation? Haven't heard anything - he's got a huge place in Manhatten. Have fun, but remember, don't spend all your commodity profits in one place. Rogers selling his nyc pad? I bet he top ticks the market. AUREEN SPILLANE, an executive at a shoe and handbag maker in New York, always thought a $100,000 salary equaled serious success. Like many professional people, however, when she finally broke the barrier, she was a bit deflated to learn that it was hardly salvation. It still took her several years of "hoarding away" and avoiding standard Manhattan indulgences - fancy food, fancy clothing - in order to afford a down payment on a one-bedroom fixer-upper on the Upper West Side. "It's not the big shiny number that you think about when you first get out of college," said Ms. Spillane, who is in her mid-30's. "Don't get me wrong, I'm making a nice living, I enjoy what I do. I'm certainly in a better position than a lot of people." "But Melania and I don't shop in the same places, let me tell you," she said, referring to the latest Mrs. Trump, Melania Knauss. "I'm not jetting off to the Bahamas." There was a time not long ago when earning six figures was a significant milestone among upwardly mobile professionals. If you were young and single in one of the nation's big cities, you could live in a building with a doorman, drive a European car, eat at fine restaurants and vacation in Jackson Hole. For married people it meant a suburban home and college savings accounts for the children. Beyond the lifestyle, $100,000 was a psychic achievement; it meant joining the meritocratic elite. The prospect of "six figures" kept white-collar workers toiling for 20 years, confident that hard work would be rewarded and that the American social contract was securely in place. Certainly $100,000, which is more than twice the national median household income of $43,527, is still a princely wage in most of the country, placing you in the top 5.2 percent of American wage earners with full-time jobs, according to the 2000 census. Even in New York City, only 7.5 percent of full-time workers make that much. But $100,000 isn't what it used to be. It has been devalued, in the practical sense by inflation and psychologically because it is now a relatively common salary for newcomers in fields like law and banking. For today's executive strivers in the more affluent cities, there is a new grail: $200,000. "It's the new black," said Bill Coleman, senior vice president in charge of compensation at Salary.com, an online career service based in Needham, Mass., that tracks executive pay. "There's a lot of bunching between $100,000 and $150,000. That's the vast majority of the people who used to aspire to $100,000. Now they are aspiring to $200,000 or $250,000." "It's the players," he added, echoing a common sentiment, "who make $200,000."